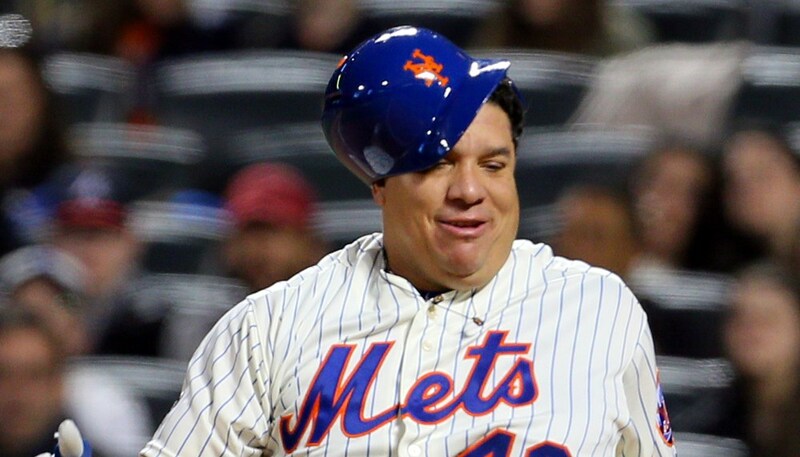 Let me start this off by saying I love Bartolo Colon. I really do. Everything about him is a joy to watch. From his care free demeanor on the mound to his helmet flying off of his head with each swing he takes at the plate – I can’t get enough of it. He’s been a pleasant surprise and a highlight free agent signing during GM Sandy Alderson’s tenure with the Mets. But manager Terry Collins made some comments last night that I found to be rather alarming regarding Colon’s mid game struggles. In the third inning of last nights game, Colon reached base on a fielding error made by Cardinals catcher Yadier Molina. He was then followed by back-to-back base hits that required Colon to “run” to reach base before being stranded at third. The following inning, after throwing three scoreless innings, Colon imploded and allowed six runs. I know, Colon isn’t exactly the model of good health. But I still find that to be disturbing. I know the line from ‘Mr. Baseball‘ goes “We’re not athletes, we’re baseball players” – and while some degree of that may hold true, not being able to run 90 feet at a time is embarrassing. At the end of the day I don’t care if Colon get on base again for the rest of the season. He’s getting paid to perform on the mound, not at the plate. But if you’re going to play baseball in the National League I expect pitchers to at the bare minimum be able to run, and I use that term very loosely with Colon, the bases without it effecting you on the mound. Here’s the clip from last night of Colon reaching base on an infield error: Your browser does not support iframes.